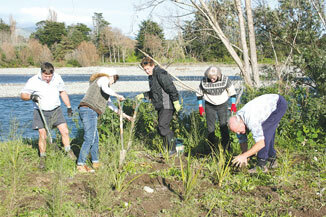 There was a good turn-out for the Friends of the Otaki River’s (FOTOR) final public planting day for the year in June. In the latest ‘Honda Tree Fund’ planting day friends worked down river of Chrystalls Bend where 1000 new native trees, grasses and shrubs were planted alongside the Otaki River. The new plantings included flaxes, kanuka, a variety of pittosporums, kowhai, kahikatea and a several different grasses. These came from Honda NZ, which donates 13 new native trees for every new car sold; the trees are given to ecological projects around the country. Fotor has received over $20,000 in trees from Honda through the scheme. Many of the newer planted areas have a beautiful wooden sign, naming groups responsible for the plantings and when they were planted, these are made by Fotor member, Eric Matthews and the poles were donated by Farmlands Otaki. “Our strength is in our membership,” secretary, Trevor Wylie said. Friends of the Otaki River members have no subscription to pay. Other areas planted this year included the Rotary 50th Jubilee plantings and Otaki School-Philipp Family Foundation days at the Otaki River estuary and the Pub Charity day at Chrystalls Bend. A new project has been the installation of two new signs on Riverbank Road telling of up-coming events, the materials for these were donated by Farmlands. The next major event will be the River Walkover with the Greater Wellington Regional Council’s Otaki river works and flood protection team on September 10.